By Dave Yochum. If business owners start to meet, greet and network in a new way during the 2020s, chances are Jim Vogel will be leading the way. The founder of Lake Norman Small Business Network attracts 70 to 90 people at stand-up networking meetings every Wednesday morning in Cornelius. It all began as a Facebook page in August of 2014. Next thing you know there were 200 people on the page, “so we decided 10 percent might show up for a meeting,” Vogel recalls. 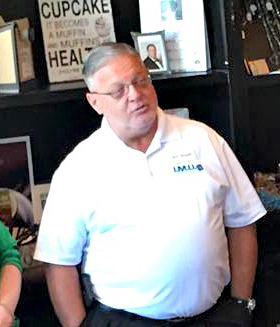 The first non-virtual meeting of the Lake Norman Small Business Network was held around a table at Waterbean Coffee in Cornelius. There were eight people. Now the LKNSBN Facebook page has more than 3,000 members who post lively comments about needing a freelance PR writer, a hair stylist or car detailing, for example, as well as moving to a new location or the chance to attend an empowerment seminar. It’s a free online and offline networking group, with no categories or restrictions except that members must live in the Lake Norman region. “I’m not a very bureaucratic being, so we don’t have a lot of rules,” says Vogel, who launched a similar networking group in the Raleigh area before moving here. “I noticed there were no groups out there that were free and totally inclusive and offered an opportunity for networking with small business owners and entrepreneurs,” he says. Vogel himself is a former Ford Motor Co. internal communications specialist who went on to a job teaching at Hendrick University. When the economy ran out of gas during the Great Recession, he was looking for work and soon met people in similar straits. He launched the Small Business Network in Apex, and reinvented himself as an entrepreneur by opening IMU Social Media, which uses contract writers to provide content for small business social media. SBN is more like a community than a chamber, says Vogel, who is a member of the Lake Norman Chamber Board of Directors. “The key is because we’re free and give great visibility, people want to join our group,” he explains. Of course, networking groups can get stale, with a same old, same old feel, too many rules and, well, blowhards who talk way too much. LKNSBN meetings are stand-up affairs which keeps everyone on their toes. The de rigueur 60-second “elevator” speech is limited to 20 seconds. What happens if an LKNSBN member runs 45 seconds or event 60 seconds? “I’m a nice guy,” Vogel says with a smile. He used the words “secret sauce” a couple of times to explain the LKNSBN success. And then Vogel said the “true secret sauce” consists of small member meet-ups, perhaps one-on-one or one-on-two or three. Meeting info: Old Town Public House, 21314 Catawba Ave., Cornelius, 9 a.m. each Wednesday, starting May 2.